This is a quiz about Om Nom (from the game - I can't tell you what though because it's one of the questions!!) that will test your Ommy knowledge to the max. Can you get 100%? If so, leave a comment below or give an example of another quiz I can do! Don't worry if you don't get all of the questions correct at first - you can always try again! Enjoy and have fun playing!! What is Om Nom's favourite food? What is Om Nom's purple friend called? What is the name of the game that Om Nom features in? 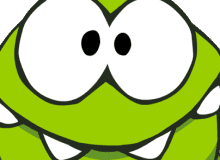 What is the name of the company that created Om Nom's game? What is the name of Om Nom's girlfriend? Where does Boo (One of Om Nom's friends) live? What is Om Nom's greatest fear? Where did Om Nom almost drown? What is Om Nom's super power as a super hero? How did Om Nom get up a tree? Quiz topic: How well do I know Om Nom? You can find more quizzes like this one in our Mobile Games Quiz category.